Mobile health, or “mHealth,” is used to describe any medical or public health practice supported by a mobile device2. A broad category, mHealth has traditionally encompassed mobile phones, personal digital assistants, and other wireless devices, relying on functionalities such as text messaging, GPS, data telecommunications systems, and Bluetooth technology2. In the United States, mHealth is most recognizable in the form of applications designed for use on a smartphone. In 2018, almost 70% of Americans own smartphones – a number which is only projected to grow over the coming decade3. 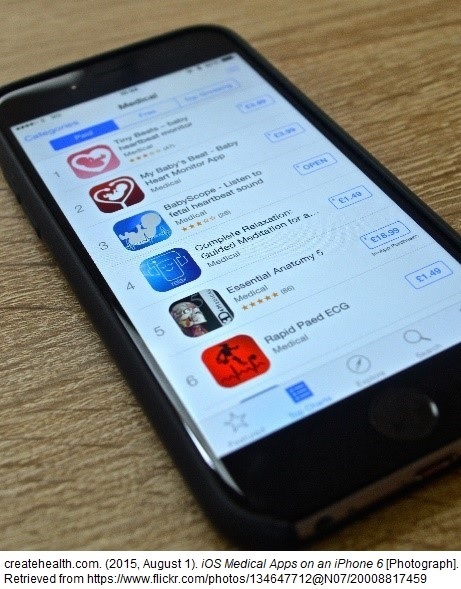 mHealth apps are becoming increasingly popular, representing over 95,000 of all apps available in the iTunes app store and over 105,000 of all apps available in the Google Play store, or about 3% of total applications4. A recent cross-sectional survey of smartphone owners across the U.S. found that over half reported using at least one health app, and of those, the majority used an mHealth app at least once per day. Tracking of nutrition and physical activity were the most common uses reported5,6, followed by facilitating communication with the medical system (e.g. appointment and medication tracking) and monitoring of medical conditions5. Although the field of mHealth is still young, research has shown that health applications are already making a difference. Among the elderly, mHealth has been shown to improve self-efficacy, medication adherence, and the quality of health behaviors such as sleep, exercise, and diet7, making it an effective tool for disease prevention and management. A recent study using data from the National Cancer Institute found that users of health apps were significantly more likely to meet physical activity recommendations6, while another study found that mHealth apps were effective in increasing consumption of healthy foods8. So what features make mHealth effective? Ease of use is important8. Taking too long to enter data and having an interface that is overly complicated are frequently cited reasons for discontinuance of app usage5. Equally important is the provision of positive feedback; apps that provide reinforcement and encouragement are more likely to create behavior change8. Findings are mixed on apps that include a social media, or “gamification” feature – although engaging with friends and family increases accountability and self-efficacy8, it also leads to concerns about the privacy of data among users5. How can mHealth help personalize health care? Provider coaching is associated with positive health behavior change8, but a high level of personalization is hard to deliver to a large volume of patients under tight time constraints. In this capacity, mHealth has the potential to connect patients and providers and deliver a level of personalization that would be otherwise impossible. Not only do health apps give providers access to a wealth of data about health metrics, they provide an opportunity for a provider to support and engage in a patient’s goals9. Apps that are personalized to patients’ lifestyles or include a coaching element have been found to be most effective in changing health behaviors10. In trials at the University of California, San Francisco and Massachusetts General, researchers found that a combination of traditional primary care and additional coaching through an mHealth app led to more significant reductions in weight and obesity-related risk factors among pediatric patients compared to patients who used the app alone8. Apps aren’t limited to the patient, however – researchers at the Duke Clinical Research Institute recently created an app for providers that analyzes data from electronic health records to determine a patient’s risk for heart disease or stroke, making it faster and easier for providers to care for their patients11. While many mHealth apps were originally intended for patient use in private settings, apps developed for clinical settings are a high-growth subset of mHealth and an important area of future expansion. mHealth technology is already transforming clinical workflows, a trend which will likely continue. In the personalized health planning model developed by the Duke Center for Personalized Health Care (Figure 1), after initial contact has been established between a patient and a provider, the patient completes an assessment of their current health status and risk behaviors in addition to a clinical assessment of health status and therapeutic needs. At these stages, a patient could benefit from a health application that allows for behavior tracking and goal identification, while apps intended for clinical settings could be employed to ensure efficient and thorough diagnostics. After completing their individual assessments, patients and providers work together to create shared health goals and a therapeutic plan called a personal health plan. In addition to applying mHealth to track health behaviors and progress towards goals, providers can leverage mHealth to coach patients and reinforce the health behaviors identified in the personal health plan. In the care coordination and follow-up stage, the data tracking features of mHealth can be useful. Providers and patients would be able to concretely track progress towards goals, identify pitfalls, and easily communicate using mobile technology. Currently, a gap exists between usage of mHealth apps outside and within the clinical context. Although more Americans than ever are using some form of mHealth, one study found that fewer than 7% of users had learned about mHealth apps from their provider, and 70% did not feel it was important for providers to know of their use of mHealth9. By leveraging health apps to improve communication and behavior change, patients and providers can work together to create personalized, whole-health experiences in an efficient and effective manner. In today’s technology-driven world, not only is mHealth here to stay, it has the potential to revolutionize how care is delivered. Health apps are already being used to improve patient-provider communication, deliver preventative care, track health behaviors, and synthesize big data to predict a patient’s risk factors. However, economic barriers to accessing technology often limit the availability of mHealth, making equity of access a key concern as the industry continues to develop. mHealth technology itself is evolving. While most apps available today are designed to track fitness, nutrition, and other personal health behaviors, a 2016 survey of mHealth professionals identified the categories of greatest market potential as those designed for remote monitoring and consultation, diagnostics, and managing medical conditions12. mHealth is becoming increasingly enmeshed in the clinical world, and as a result, a vision of personalized health care revolving around individualized health plans and shared patient-provider goals becomes clearer. 3. eMarketer. (n.d.). Smartphone penetration rate as share of the population in the United States from 2010 to 2021*. In Statista – The Statistics Portal. Retrieved September 26, 2018, from https://www.statista.com/statistics/201183/forecast-of-smartphone-penetration-in-the-us/. 12. eMarketer. (n.d.). Greatest market potential of mobile health app categories according to mHealth professionals as of 2016. In Statista – The Statistics Portal. Retrieved September 25, 2018, from https://www.statista.com/statistics/655148/market-potential-of-mobile-health-app-categories/.